I am so in love with this adorable dress from BCBGMaxAzria and all its little details, especially the juxtaposition of the flower print with the lace "cutouts". (They are not really cutouts; the dress has a soft beige lining.) It's truly unique and like nothing else in my closet. Maybe it's because I've been working so much, but this week seems to be flying by. I actually thought it was Tuesday for the first half of the day! I'm glad it's not, because I have a fun evening planned. First, I'll be picking up the painting I had commissioned of George. Isn't it wonderful? Ali Leja, of Ali Leja Designs in Johns Creek, Georgia, did such a beautiful job capturing George and his sweet spirit. I'll also be having dinner with my parents and sisters at the Avalon shopping center in Alpharetta. It's so rare that just the five of us can get together, without kids and husband tagging along. I can't wait! AWW....... 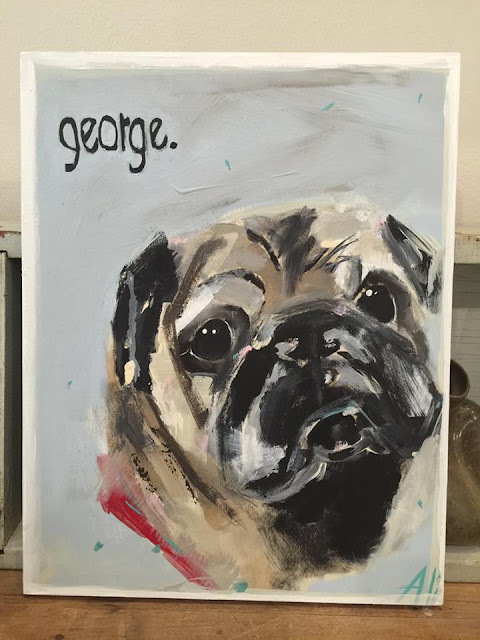 The ' GEORGE ' painting is SO sweet, and well done!! what a great remembrance of him ! !